If you are planning a wedding and/or reception and need more than a couple of items, we would like to meet with you before bidding on the equipment you need. The meeting takes about an hour to an hour and a half and our customers seem to enjoy the process. Customers typically leave the store with a completed bid (or a partial one if we are pricing a custom design and need more time) and “homework”. The following list includes common “homework” questions and a few tips. Time Saving Tip: If you want a ceiling treatment bid, ask your venue whether they allow attachments to the ceiling. Many venues are not able to allow it. What equipment does the venue provide? How many tables and chairs and what sizes/shapes are they (ex 2-8’ long tables, 5-6’ long tables)? Time Saving Tip: If your reception will be in a private space or a church hall with which we are not likely to be familiar, bring the dimensions (length/width) of the room. 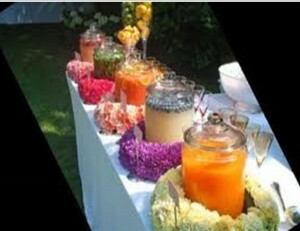 What equipment will your DJ, caterer and bartender need (tables, linens, etc)? Will you want equipment delivered and picked up or will you handle the transport of equipment? Cost Saving Tip: There are charges for delivery/pickup during regular hours and additional charges for after-hours service. Many of the venues are able to allow you to leave the rental equipment until Monday (for a weekend event) to save after-hours pick-up charges. Talk to your venue to see if this is an option. Will you set up/break down the rental equipment (tables, chairs, etc)? Stress Saving Tip: We often set up equipment for the customer when there is little lead time at the venue before the event. If you can’t set up the venue the day before the event, consider hiring set-up service. Event planning is a process of making multiple decisions with one decision impacting other decisions. The completed bid is rarely the final selection but it jump-starts the decision making process. If you have a venue and you are ready to jump-start the process, set up an appointment by calling 254.772.5667 or email your request to rsvpwacotx@centexbiz.rr.com.